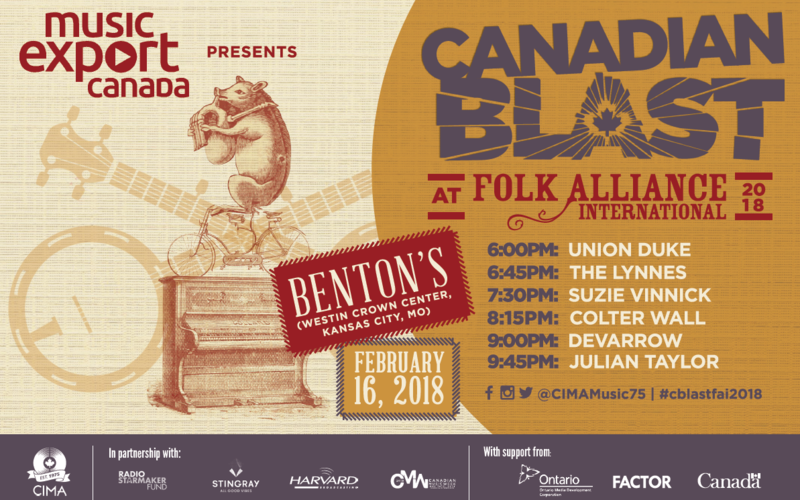 This February, CIMA will be returning to Kansas City, Missouri for the 2018 edition of Folk Alliance International. This year marks the 29th year of the world’s largest gathering of the folk music industry and community, attracting over 2,000 artists and industry professionals (agents, managers, publishers, labels, festivals, promoters and media) dedicated to folk music. For more information about Folk Alliance, click here. If you’d like to see a recap of the outcomes of CIMA’s mission to Folk Alliance in 2017, please click here. This year’s Canadian Blast showcase will take place at Benton’s (Westin Crown Center) on Friday, February 16, 2018. Don't miss 3 nights of MusicOntario showcases at the West Crown Center in Room 640! Full details here.